Daniel Pinillos scored a 94th-minute equaliser to earn Nottingham Forest a draw with Derby in a meeting of the East Midlands' two newest managers. Zach Clough's prodded finish from a brilliant Pinillos cross gave new Reds boss Mark Warburton a perfect start. Matej Vydra levelled after the break with a sliding effort before David Nugent headed home six minutes later for Gary Rowett's Rams. 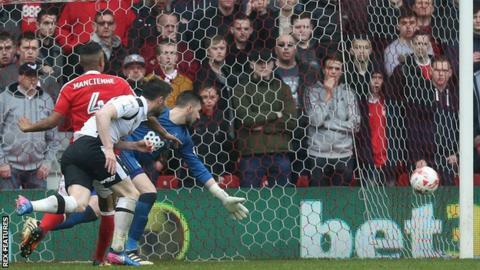 But Pinillos' header earned a point and kept Forest out of the drop zone. The leveller came from a corner after substitute Apostolos Vellios saw his shot cannon off the post from 20 yards deep in stoppage time. Two managers appointed at opposite ends of Brian Clough Way on Tuesday have two very different jobs ahead of them. For Warburton, victory seemed imperative as Forest tried to avoid tumbling into the Championship relegation zone - a fate they avoided thanks to Pinillos' late effort and Aiden McGeady's injury-time equaliser to earn Preston a 2-2 draw at Blackburn in the division's other early kick-off. Rowett's remit, however, is nowhere near as perilous as Derby travelled to the City Ground in mid-table after just one win from nine previous league games. The draw leaves them 10th, nine points adrift of sixth-placed Sheffield Wednesday, who lost 2-0 to Reading on Friday. Former Rangers boss Warburton only had four days to influence a Forest side sliding towards relegation trouble, taking over after a run of five defeats from their previous seven games under interim boss Gary Brazil. The Reds got a huge early boost, thanks for Clough's excellently slotted fifth-minute goal, which instilled confidence and sparked a period of sustained pressure for the hosts. Ben Osborn was influential at both ends for Forest, and 17-year-old Ben Brereton was a dashing presence on the right from where he ghosted in to have a shot blocked by Craig Bryson after Britt Assombalonga clipped a cross off the top of the crossbar to cause confusion in the box. Two goals in six second-half minutes from Vydra and Nugent transformed the game as the Rams, so ineffectual before the break, flooded forward with relentless endeavour. Vydra equalised with a sliding finish, meeting a low cross from Johnny Russell and Nugent then had then 1,951 travelling fans in raptures, nodding in off the post from a Bradley Johnson delivery. Both sides continued to create chances, Tom Ince hitting the top of the bar with a free-kick and Johnson, Alex Pearce and Jacob Butterfield testing home goalkeeper Jordan Smith, while Forest substitute Ross McCormack had a shot blocked just minutes after he was brought off the bench to replace Clough. But those jeers turned to cheers when Pinillos struck to earn Forest a draw. Nottingham Forest boss Mark Warburton: "The most pleasing thing was the character the players showed to get control of the game again. "It would have been very upsetting not to to take something from the game. After a really pleasing first half, it was frustrating to find yourself 2-1 down. But they showed great character and that got the late reward. We deserved the point. "We have been with the players for three days, you ask them to do certain things, you don't want to change too much at short notice, but you ask them to get on the football, to be brave and pass the football. In the first half, they showed they can do that. We challenged them, they dealt with it and that is very pleasing." Derby boss Gary Rowett: "It was a fantastic game to be back and be part of. "I was looking forward to seeing what we learned, looking forward to seeing some of the things they would do well and things they would do not so well. You always have to have that overview, that rationale about the first game. "At half-time we just spoke about relaxing a little bit, the longer it was 1-0 the more pressure we could put on and the more edgy they would get. To get the goal so early in the second half, at that point we were in complete control and really dominant and moved the ball fantastically well. "The disappointing thing from there, having been in control, was that we have to see things out. But I'm not going to be critical of the players because I don't know what we want completely yet." Match ends, Nottingham Forest 2, Derby County 2. Second Half ends, Nottingham Forest 2, Derby County 2. Bradley Johnson (Derby County) is shown the yellow card. Goal! Nottingham Forest 2, Derby County 2. Daniel Pinillos (Nottingham Forest) header from the centre of the box to the bottom left corner. Assisted by Ben Osborn with a cross following a corner. Corner, Nottingham Forest. Conceded by Scott Carson. Attempt saved. Ben Osborn (Nottingham Forest) left footed shot from a difficult angle on the left is saved in the bottom left corner. Assisted by Ben Brereton. Apostolos Vellios (Nottingham Forest) hits the left post with a left footed shot from outside the box. Assisted by Ben Osborn. Daniel Fox (Nottingham Forest) wins a free kick in the attacking half. Corner, Nottingham Forest. Conceded by Markus Olsson. Substitution, Derby County. Mason Bennett replaces David Nugent. Attempt missed. Daniel Fox (Nottingham Forest) header from the centre of the box is close, but misses to the right. Assisted by Ben Osborn with a cross following a set piece situation. Corner, Derby County. Conceded by Jordan Smith. Attempt saved. Jacob Butterfield (Derby County) left footed shot from outside the box is saved in the bottom right corner. Assisted by Craig Bryson. Attempt missed. Tom Ince (Derby County) left footed shot from the right side of the box is close, but misses to the left. Assisted by Chris Baird. Attempt saved. David Nugent (Derby County) left footed shot from outside the box is saved in the top right corner. Substitution, Derby County. Jacob Butterfield replaces Matej Vydra. Attempt missed. Ross McCormack (Nottingham Forest) left footed shot from outside the box is too high. Assisted by David Vaughan. Substitution, Nottingham Forest. Matthew Cash replaces Chris Cohen. Attempt blocked. Ross McCormack (Nottingham Forest) right footed shot from the centre of the box is blocked. Assisted by David Vaughan. Corner, Derby County. Conceded by Daniel Pinillos. Attempt saved. Alex Pearce (Derby County) header from the centre of the box is saved in the centre of the goal. Assisted by Tom Ince with a cross. Corner, Derby County. Conceded by David Vaughan. Substitution, Nottingham Forest. Ross McCormack replaces Zach Clough. Attempt saved. Bradley Johnson (Derby County) left footed shot from outside the box is saved in the top left corner. Assisted by Craig Bryson.